A lot has been written in local publications, this one included, about the declining number of businesses in the downtown Village along La Mesa Boulevard. 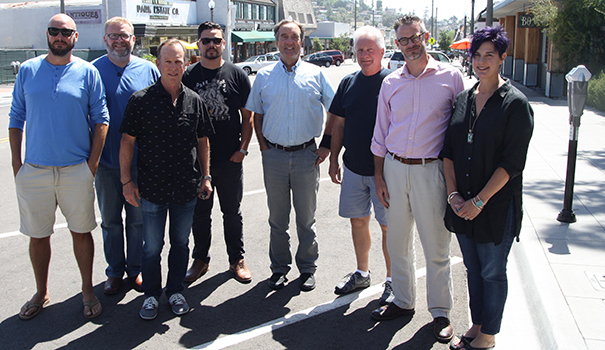 But many business owners, both long-time operators and new investors in La Mesa, believe downtown’s future is about to be the brightest it has ever been thanks to improvements like the streetscape project, shifting demographics and a commitment by the city to refocus on popular events. Dean said he sees the future of downtown La Mesa as something akin to the Little Italy neighborhood in San Diego with lots of restaurants and coffee houses, but also with shops. His own ventures along the boulevard speak to that vision — an Asian-fusion restaurant called Boulevard Noodles; a traditional coffee shop with breakfasts and pastries called Sheldon’s; and a mixed-use building with condos above what he hopes will be a bakery that he is building with the Patio Group. Dean is not the only investor banking on the vision of a more culinary-based future. The Cohn Family Restaurants will soon be opening a game-centric taproom called Coin Haus next door to the Bo-Beau Kitchen + Garden it owns on the corner of La Mesa Boulevard and Allison Avenue. Moving into the space once occupied by Cosmos Coffee Café is the craft coffee shop Public Square owned by Aaron Hernandez. And another new restaurant called Four Penny House, opening next to Boulevard Noodles, will focus on beer, bread and both local and seasonal fare. Four Penny House owner Peter Soutowood sees La Mesa as a great investment because of a changing demographic that is hungry for the kind of social activities they are accustomed to. John Bedlion said he saw the potential of La Mesa’s downtown area years ago when he bought the “drug-infested, dangerous and awful” establishment he turned into what is now Johnny B’s. 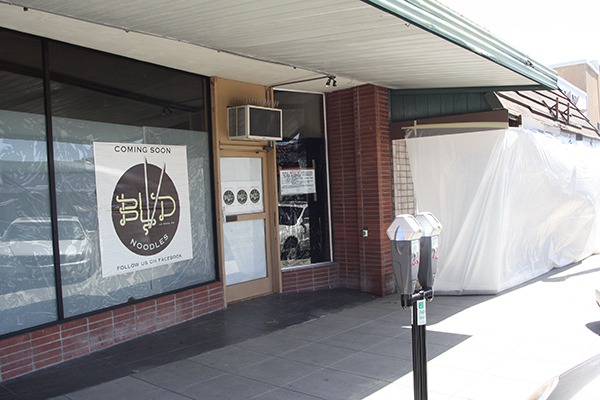 Bedlion also sees La Mesa growing into a destination for people to eat out and shop because there is a shortage of quality restaurants, not just in the city, but in most of East County. However, not everyone will be accepting of the changes to La Mesa’s sleepy feel. In order for downtown La Mesa to have that eat, shop and play feel, it will need to replace existing office-type businesses that currently occupy much of the potential retail space. Soutowood agrees that to achieve a vibrant downtown, the businesses need to be the kind that pique peoples’ interest to stroll in and out of buildings. Guy Blumenthal of Blumenthal Jewelers agrees and he recently moved his showroom on La Mesa Boulevard to a cottage on Date Street because it is a better fit for his business. Blumenthal has operated in La Mesa for over 25 years and in that time, his vision for downtown has shifted with the changes in how retail business is done. Keeping costs down is what eventually will cause the office businesses on the boulevard to move as well, Blumenthal said. Rent used be as low as $300 a month, which attracted hobbyists and not serious businesses, Blumenthal said, which made it difficult to market the area and bring people to shop and dine there. “When we met as a city and the new City Council, we realized that one of the goals for us to do was promote and market our city,” City Councilmember Guy McWhirter said. Marketing La Mesa has taken many forms, from promoting and revamping events like Oktoberfest, the classic car shows and Christmas in the Village, to the streetscape project that “remodeled” the sidewalks along La Mesa Boulevard. “What Guy and the council have done with the redevelopment of the street is fantastic,” Dean said. But not everyone was pleased and many people blame the roughly year-long project for closures of several local businesses along the Boulevard, an allegation that McWhirter refutes. But, he added, businesses like Sanfillipo’s had other issues like the coming $15-an-hour minimum wage to contend with; O’Dunn Fine Art Gallery found that La Mesa wasn’t ready for an art gallery; and Cosmos had a change of ownership that effected business. Theresa Favro, owner Amethyst Moon, moved her gift shop back to La Mesa just before the streetscape project began. Before that, she operated her shop in El Cajon but moved after she sold her building because a similar construction project there slowed her business. Favro, like other retail spaces that rely on walk-in traffic, struggled through the streetscape but now sees the finished boulevard as a great opportunity for expansion. Hi Jeff. Nice talking to you today about you coming on my show & us cross promoting! Hi Jeff. We talked about your article on yesterday’s show .